I currently have two MagicJack Plus units (two numbers with multiple years left on the plan) ... problem is that one of these numbers are for my home office fax and my HP C7280 does not want to work with the MagicJack plus. I was wondering if I could use the Cisco PAP2T Internet Phone Adapter with 2 VoIP Ports in lieu of my two MagicJack Plus units. 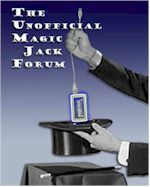 As you have certainly already learned by having read through previous postings before opening a new thread, it has been about three years since it was possible to extract SIP credentials from a MagicJack device in order to use them with higher quality equipment.